The Duo turntable has a detachable wireless speaker and Alexa voice control | What Hi-Fi? The popularity of vinyl shows no immediate signs of abating, so it's no surprise we're seeing plenty of innovative new turntable systems. 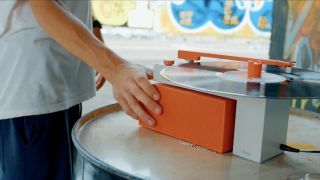 This one adds a twist we're somewhat surprised we haven't seen before - not content with adding speakers, the Duo turntable makes it a detachable, portable Bluetooth wireless speaker. The Duo turntable is a live Kickstarter project, which has already reached double its target amount - making it more likely to become an actual product rather than just a series of pretty pictures and videos. Though there are also lots of those on the Kickstarter page. We've looked at systems from Crosley that offer a complete record player and speakers (please avoid those), while decks such as the Pro-Ject Juke Box E offer a 'just-add-speakers' solution, but the Duo's detachable wireless speaker, as well as built-in amplification, is a novel twist. The speaker features aptX Bluetooth, a 10-hour battery life, a wireless range of 10 to 15 metres and it weighs just 800g. The turntable meanwhile has a tiny 3.2in platter - 1/4 the size of a regular record player, has a belt-drive design and can play at 33 and 45 rpm. There's an Audio-Technica AT3600L cartridge with a fairly typical 2.5g tracking force, and a spring-weighted tonearm, as opposed to the traditional counterweight. If that wasn't enough tech, the Duo also sports Amazon Alexa voice control, which means you can also bark the typical Alexa commands at the speaker. The Duo turntable is available at a range of prices, as is standard on Kickstarter, with the current most affordable option for the turntable and speaker sitting at $299. Which seems pretty good value to us based on the spec sheet alone. You can see all about the Duo turntable on Kickstarter.